This is beautiful Sylvie, lovely colours. I love the vibrant blue colour of your flowers. Such a pretty stamp. Hugs Mrs A. SO pretty, love the colours. Ooh this is so funky and fabulous! 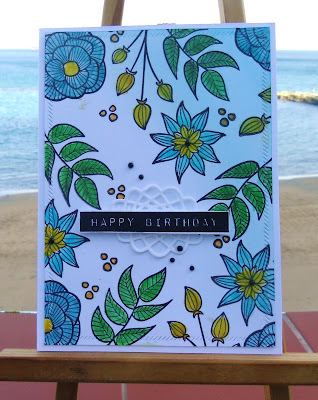 Gorgeous Sylvia, love the colours, don't have any altenew stamps but they certainly do great florals. Thanks for popping over to my blog too. And funny how you're a follower on my blog but I've fallen off yours, so I've joined back up. You can never tell with blogger.